The village of Varenna, along the shores of Lake Como in northern Italy, is possibly the most peaceful and authentically beautiful place I have ever seen. The huge lake, at the base of the Swiss Alps, was glass-like except for the occasional wake of a water taxi taking passengers to Bellagio, the stunning gardens of Villa Carlotta and other points north. 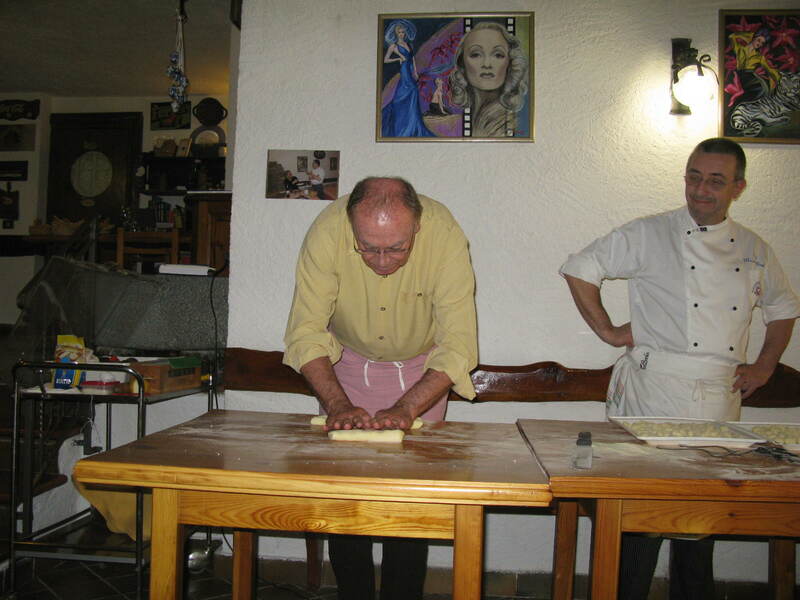 Another lasting memory of this area was the opportunity to make gnocchi, risotto and other dishes with chef Moreno Maglia, owner of Il Caminetto Ristorante, in the rugged hills above the village. The success of Il Caminetto Ristorante is based upon reputation, not walk-in traffic. In fact, the only way that you can, or would want to get to it is to be transported and returned to the village in a van or taxi. The narrow, winding road up to the site would not be something that anyone but locals could manage; two-way traffic on a one-way road that requires the sound of a horn to warn potential on-coming automobiles of your presence. My advice is to close your eyes, think about great food and pray that you’ll make it, both up the hill and down. “Please speak slowly, my English is like my pasta, homemade” cautioned the chef after a barrage of questions about his cooking philosophy. He finally offered, “few rules, more passion” which was the first indication that we needed a sharp pencil, plenty of paper and enough power for the video camera. We arrived within minutes, greeted by a cappuccino, biscotti and the menu for today’s class: Pancetta-wrapped Pork Sirloin, Gnocchi with Gorgonzola Sauce and Risotto with Strawberries and Balsamic. What follows are not recipes, but my best recollection of the class to, hopefully, stimulate your improvisational cooking skills. Proclaiming “everything in moderation,” Chef Moreno trimmed some and left some fat on a gorgeous pork sirloin. After seasoning with Kosher salt and ground black pepper, he cut several two-inch deep slices that were filled with fresh rosemary twigs before preparing a fresh rub, consisting of finely chopped lemon zest, rosemary, thyme and marjoram. The herb mixture was then spread on the sirloin, pressing it in for complete and even coverage. Warning us not to be “skimpy,” he then wrapped the entire upper sirloin with 1.5 lbs. 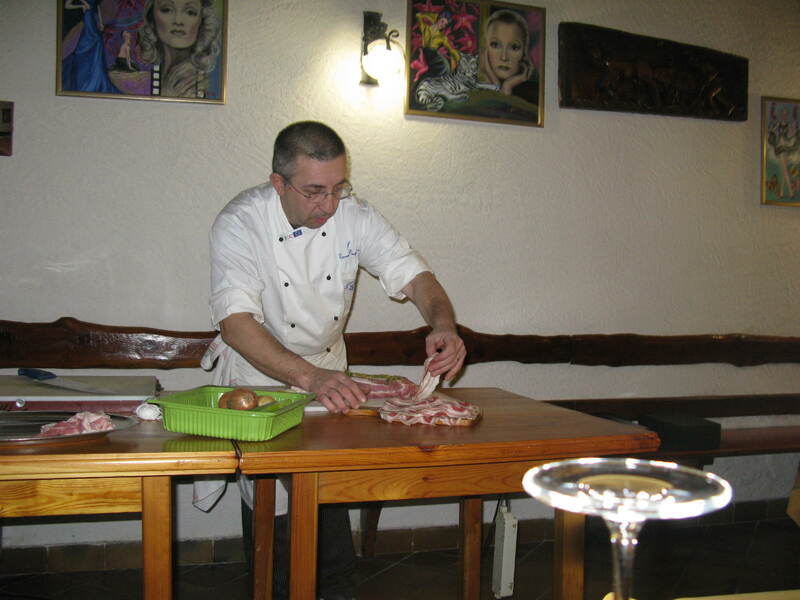 of pancetta, which is Italian bacon that is cured, seasoned and dried for several months. His pancetta was thicker than most commercially found in stores. True “foodies” can have it cut thicker at butcher shops. After the rub and pancetta wrap, the sirloin was wound tightly, 8-10 times with string and set aside while the bed of vegetables was prepared. The vegetables, consisting of leeks (tops only), cut in ½ inch pieces, sliced carrots, onions and celery are mixed with good extra-virgin olive oil and, for those inclined, some of the trimmed fat from the meat. 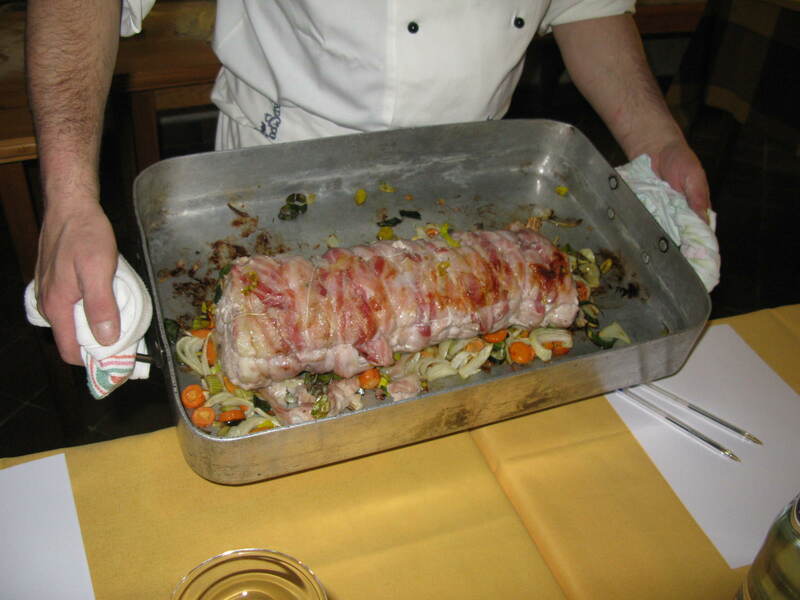 Then the pancetta wrapped pork is laid atop the vegetables and trimmed fat. After adding 2-3 large glasses of dry white wine to the pan, it is roasted on all sides for an hour and a half at 375 degrees, turning two times, finishing with the pancetta on the top. When the wine reduces, Chef suggests adding 3-4 glasses of beef or veal stock and, if it begins to dry out, covering with foil. With the sirloin comfortably in the oven, protocol requires a glass of Rosso di Vatellino Vendemmia Nebbiolo 2006 or other suitable Italian red wine before moving to the gnocchi. We all agreed that it was 5pm somewhere. Adding 4 tbsp. white flour, 1.5 litre cold water, a pinch of salt and black pepper to the vegetable mixture, then skimming with a level wooden spoon before straining can make a simple pork loin sauce. As Chef Moreno tossed out the vegetables for chicken feed, we thought it smelled good enough to eat. Gnocchi (“noki”) is a dumpling-like, potato based pasta served in most fine Italian restaurants. Our next task was to prepare fresh gnocchi from scratch by first boiling 2.5 lbs. potatoes, with skins, until there is some resistance with the knife, then gingerly peeling them (NO FOOD PROCESSORS ALLOWED) while they are still hot enough to burn your fingers. Where’s the sous chef? Oh, I guess that would be me. Once peeled, the potatoes are shredded through a “potato ricer”, available at gourmet kitchen shops. I found mine at Williams-Sonoma in Pasadena for $32. Chef Moreno warned that if the ricer is not put into cold water immediately after use, it might be the last time it is usable. Apparently, hot water can actually cook the residue into the device. A generous portion of freshly grated parmesan or other “grana” cheese and 3 oz. of flour is added to the potatoes before the kneading process begins. Hopefully, the potatoes have cooled off a little. The next step is to knead together the potatoes, flour and cheese into a big ball. Once the dough is ready, it is separated into 1-½ inch balls that are set-aside for a few minutes. After spreading durum flour on the cutting board to help shape the dough, the gnocchi balls are gently rolled inside out, using spread fingers, into sticks approximately 18 inches long. Impressed with my “gnocchi rolling” skills, Chef asked if I was an engineer, stating they usually perform well during this stage of the process. After answering in the negative, I became more determined to out do any engineer, past, present or future. Once the sticks are cut into one inch pieces, they begin to look, with one exception, like the gnocchi you see in restaurants. The exception is the trademark serrated edge that is the most delicate, yet difficult part of the entire process. Each little gnocchi piece is held with two fingers and softly, but quickly slid along a fork to make the serrated edge. In teaching this step to students, Chef encourages them to say “shut up” as they snap the little gnocchi ball across the fork. I guessed that it was some type of rhythm thing, but it seemed to work. Using a large spatula, the gnocchi is then moved onto trays for inspection before putting them into boiling water for the brief cooking time. If they are too dense, you have used too much flour. The little balls are then cooked in boiling water until they rise to the surface, ready to eat. They’re best eaten right away or the same day. If you must make the gnocchi the day before serving, put them into a plastic bag with a little olive oil and refrigerate. The next day, re-boil in salt water until they rise to the surface. Since we generally don’t eat pasta without sauce, there is one more caloric step in the process. The sauce for the gnocchi combines sliced leeks (white stems only), Gorgonzola cheese (3 tbsp for 4 portions), extra-virgin olive oil and one cup heavy cream. Cook the leeks over medium heat until they become translucent; add cream, black pepper, then the cheese. The reduced sauce is ready when it coats the spoon. Pour the sauce over an individual bowl of gnocchi and enjoy, preferably with another glass of wine. Although, it would be too heavy to add risotto to a meal of pancetta-covered pork sirloin and gnocchi, the rice mixture can be paired with a fresh salad for an exceptional Italian meal. Cooking risotto, for most amateur chefs, falls into the category of “easier said then done.” My attempts usually become too soft and sticky or too crunchy. Hopefully, Chef Moreno can help me to improve and impress my friends with Risotto with Strawberries and Balsamic. 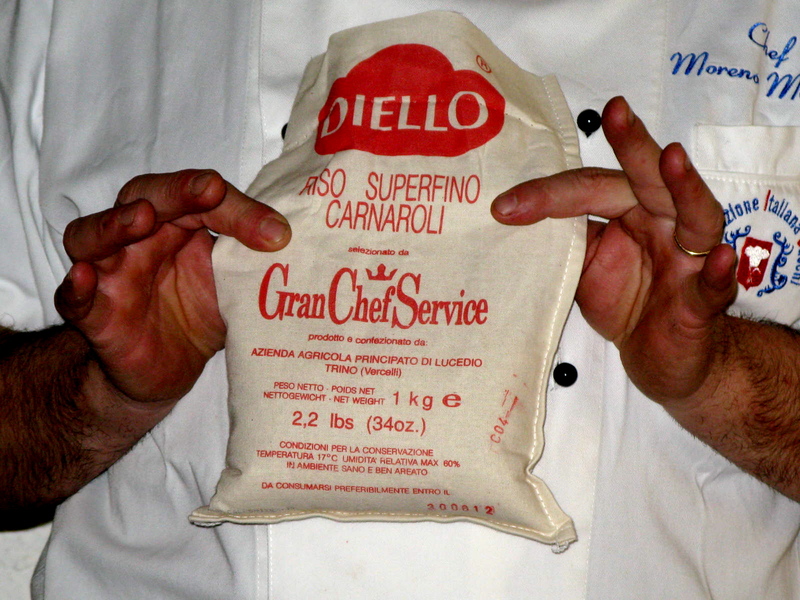 He said that a good start would be to use Carnaroli or another quality brand of rice. To prepare this dish for four portions, Chef recommends 11 oz. rice, 3 oz. unsalted butter, 4-5 strawberries, 4 tbsp. balsamic vinegar, 2.5 litres of vegetable stock and 2 oz parmigiano-reggiano cheese. Start by melting one tbsp. butter in a shallow pot, then add the rice, pushing down with a wooden spoon and toasting until shiny. Secondly, add the vinegar and reduce, then add already hot stock. Next, add the strawberries, cook for 18-19 minutes, adding more stock as the mixture gets dry. Finally, add 2 tbsp. butter, the cheese and black pepper. Chef Moreno’s risotto was not too dry, not too “mushy” with balanced flavors, none over-powering the other. With his lead and some practice, we can, eventually master the art. However, like a good wine, we will need time. 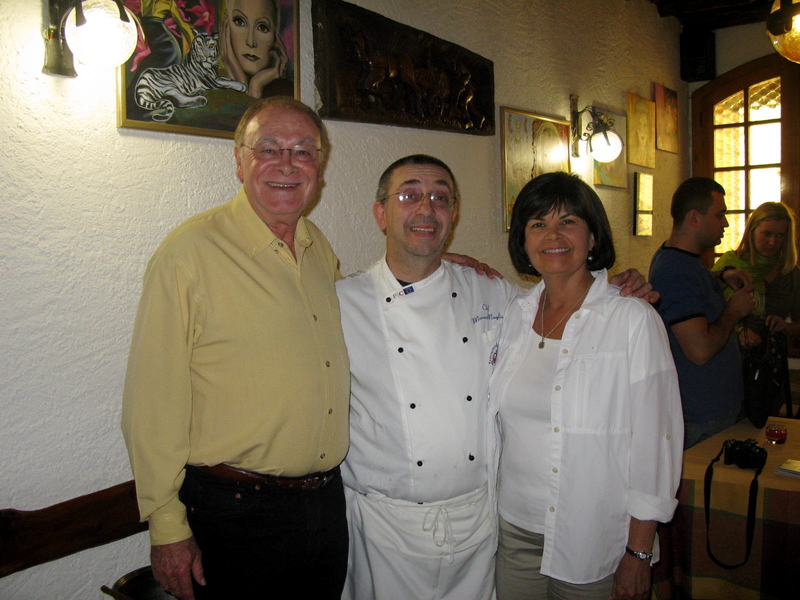 This was one of our most memorable days in Italy. Chef Moreno is both knowledgeable and charming and his family’s history with the stone building restaurant and inn (circa 1785) is almost beyond comprehension. The next time you are in Varenna, contact him at +39-0341-815-225 or info@caminettoonline.com for a culinary experience and a ride up and down the hill that you soon won’t forget. The following evening, just beginning to think about food again, we found a great menu in the restaurant at the Hotel Villa Cipressi, overlooking the lake. 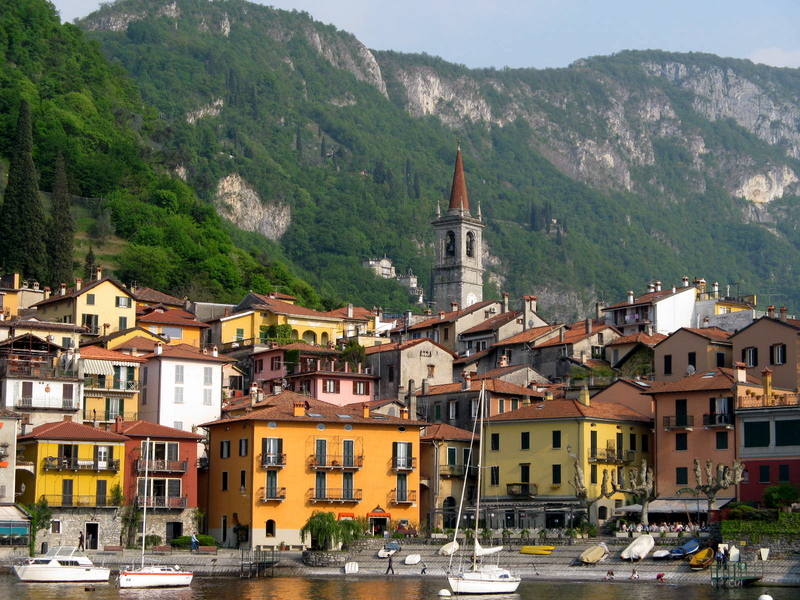 Who knew that, after traveling through Rome and Verona, our top culinary experiences would be in Varenna, midway up the shores of beautiful Lake Como. If this is not paradise, it’s close enough for my taste. This entry was posted on Saturday, June 25th, 2011 at 2:29 pm	and posted in Food, Travel. You can follow any responses to this entry through the RSS 2.0 feed.